Peterhead manager Jim McInally says his team must cut the supply to Raith Rovers forward Lewis Vaughan if they are to cause a cup shock this afternoon. The Blue Toon host the Kirkcaldy side at Balmoor in the third round of the competition and McInally is well aware of the threat posed by the in-form 21-year-old, who has netted 18 goals in 20 matches this season. 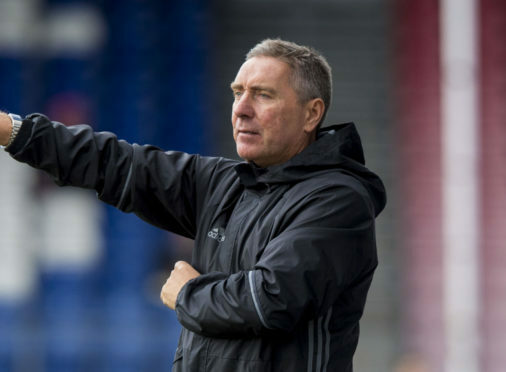 McInally said: “I’m looking forward to the match. “There probably won’t be a lot expected of us but I think we are capable of surprising them. “Raith Rovers have some very good attacking players with Liam Buchanan and Greig Spence up front but Lewis Vaughan is the main man. “Everything they do well tends to go through him. “He scored in 10 consecutive games at the start of the season. “I had someone down watching their game against Dumbarton last week. He said that although they didn’t play well, Vaughan is the player that makes them tick. “We need to be wary of him but we have to remember to take part in the game as well. McInally could hand a Blue Toon debut to 19-year-old midfielder Aaron Morris, who joined the club earlier this week after being released by Aberdeen at the end of last season. McInally added: “We haven’t signed him because he is from Peterhead. “I know in a perfect world we would have a team full of Peterhead players but every club is the same. “There aren’t many Aberdonians playing for the Dons or Glaswegians playing for Celtic. “It is great that he is from Peterhead but he has been signed on merit. “He has impressed us in training and we feel he has earned the right to be with us. “He gives us options in midfield as he can play in the wider areas as well. “He is coming back from a double hernia operation. Peterhead will be without Scott Brown (hamstring) for at least a couple of weeks, while Marc Lawrence remains sidelined with a back problem.